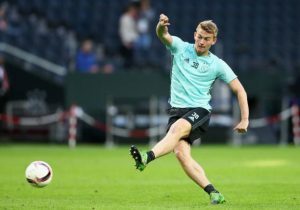 Chelsea One Of Many Interested In Versatile German Attacker: Perfect Fit For Conte? 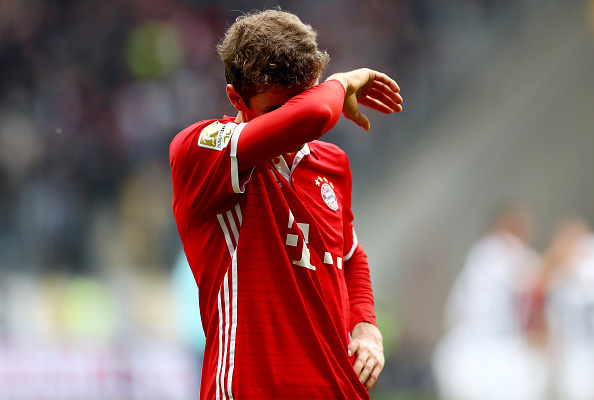 If reports are to be believed, German international Thomas Muller is really unhappy with his reduced playing time at Bayern Munich with his relations with manager Carlo Ancelotti under question. He has been a target for a host of clubs with Premier League side Chelsea one of them and the Blues could make an approach soon. Though it sounds much like a far fetched rumour, Muller wouldn’t really want to sit the prime period of his career on the bench especially with the World Cup next year and with Chelsea having a good enough squad to lure him to Stamford Bridge, he is surely considering this as a possibility. However, the Blues will face tough competition from Premier League rivals Manchester United and Arsenal as luring Muller over them would be difficult. Chelsea ended the transfer window with two central midfielders in Tiemoue Bakayoko and Danny Drinkwater, but manager Antonio Conte knows well that he hasn’t been able to replace Nemanja Matic completely yet, who would probably be the lynchpin to Manchester United’s title winning campaign this season. Unlike last season, Chelsea will need much more options to race on all fronts this time and while the likes of Bakayoko and Drinkwater will take care of the work rate, the Italian manager will need someone who could make things happen from the deep midfield. And the German star looks perfect for that role by all means. After a terrible spell last season where the 27-year-old went a whopping 999 minutes without a goal, he will hope for a better campaign this time. His quality remains undeniable as he managed to register 12 assists and five goals in his worst season. He had scored three goals in the Champions League too. Muller’s biggest quality lies in his tremendous versatility across the attacking third. He can play in the attacking midfield, right midfield, centre forward as well as left wing and with equal ease. Although he isn’t as meticulous with his defending, he pretty much excels in everything and is a complete midfielder. He is a predator to put it in simple terms. With such sharp movements, ability to read the game and world class finishing, he will be capable of walking into any club at the moment. Since breaking into the senior team in a full-fledged manner back in the 2009-10 season, Muller has scored a whopping 161 goals and provided 133 assists in 399 games. So can Chelsea lure him to London? 4-2-3-1 Manchester United Predicted Line-up Vs Stoke City: Can They Continue Their Winning Streak? 4-5-1 Aston Villa Predicted Line-up To Face Brentford: Snodgrass To Get A Start? Barcelona Looking To Instil Fresh Blood: Will This Dutch Midfielder Change Their Fortunes? Barcelona Given Boost In Pursuit Of German Midfield Marshall: Can He Excel At Camp Nou? 4-2-3-1 Bayern Munich Predicted Lineup Vs Mainz: Robben And Ribery On The Flanks? Bayern Munich Willing To Let Star Midfielder Wanted By Chelsea Leave: Good Move For The Blues? 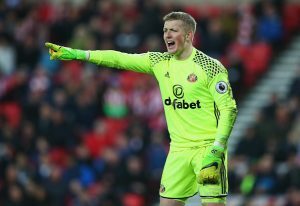 24 Y/O Everton Goalkeeper On Bayern Munich’s Radar: Why The Toffees Should Never Let Him Leave!